I have been keeping a close eye and ear on Hyperkin's soon to be new hardware offer, the Retron5, a 10-in-1 console that will hopefully replace my ageing Super Nintendo and Megadrive, along with the possibility to play NES, Famicom, Super Famicom, Japanese Megadrive, Game Boy, Game Boy Color and Game Boy Advance. If you're lucky to have a SEGA Power Base Converter you will also be able to play Master System on this beauty. No more region locks! But don't take my word for it, why not visit the brand new website for the console? We all know hardware clones live and die by their ability to properly emulate the real deal, but Hyperkin's offering certainly seems to have that covered, with extensive successful tests of know "problematic" carts like "Starfox" running everything as they should. However what really makes this shine is the features you can see on the UI picture above for graphic enhancements not unlike software emulators. All of this in glorious HDMI 720p resolution running at super-duper 60 frames-per-second means you will truly be able to count the pixels of Mario's 8-bit moustache. 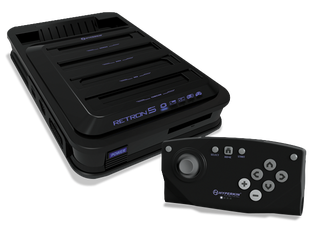 I was a bit bummed when it was revealed the Retron5 was going to miss their planned Christmas 2013 release date (due to faulty NES pin connectors no less) but April 2014 is right around the corner and I am still quite looking forward to put my retro happy hands on a black one. I will even give the controller a try, but if all else fails, know that the console is compatible with all the original controllers.